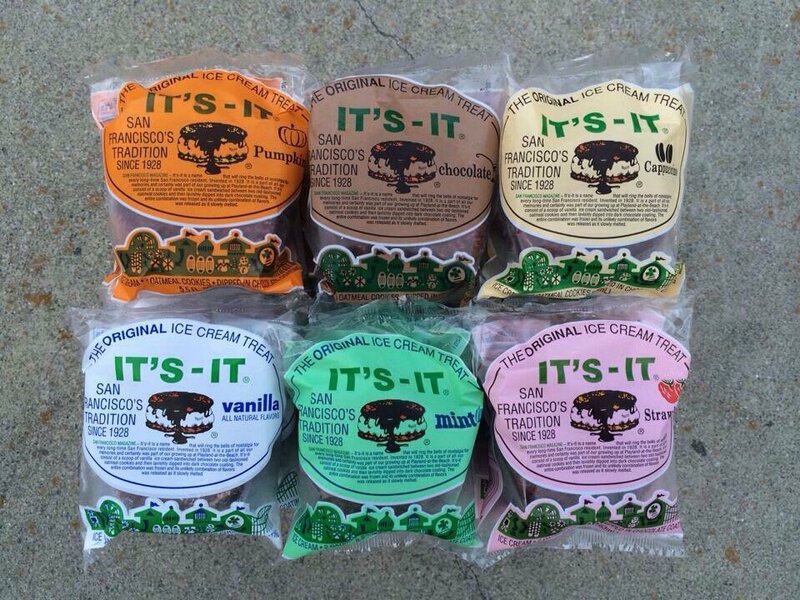 You seriously have not lived until you’ve had an It’s-It ice cream sandwich. Every time I am in San Francisco, I eat 2-3 of these bad boys so after many requests here it is: the Pâté official It’s-It Ice Cream Sandwich recipe. In short, It’s-Its are delicious oatmeal cookie ice cream sandwiches dipped in chocolate. “But Pâté–what’s so special about a chocolate dipped ice cream sandwich?” You watch your mouth. 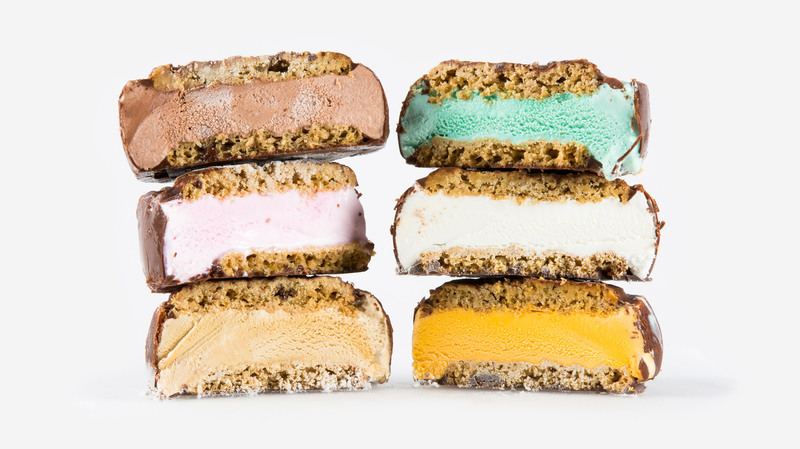 It’s It ice cream sandwiches are the perfect balance of texture, sweetness, and fun. The chocolate shell is satisfying to bite into and they include a chewy lightly sweet oatmeal cookie that doesn’t overpower the ice cream. The ice cream flavors are also a great mix of classic favorites to random delights (did I mention they have a pumpkin flavor available year round?). It’s It are so beloved, they are specially packaged to be served at Google’s HQ. 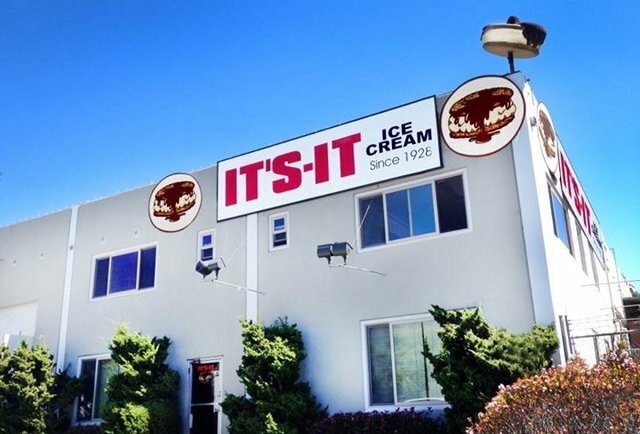 We tried our best to recreate the Its It ice cream colors. Source: It’s-It. 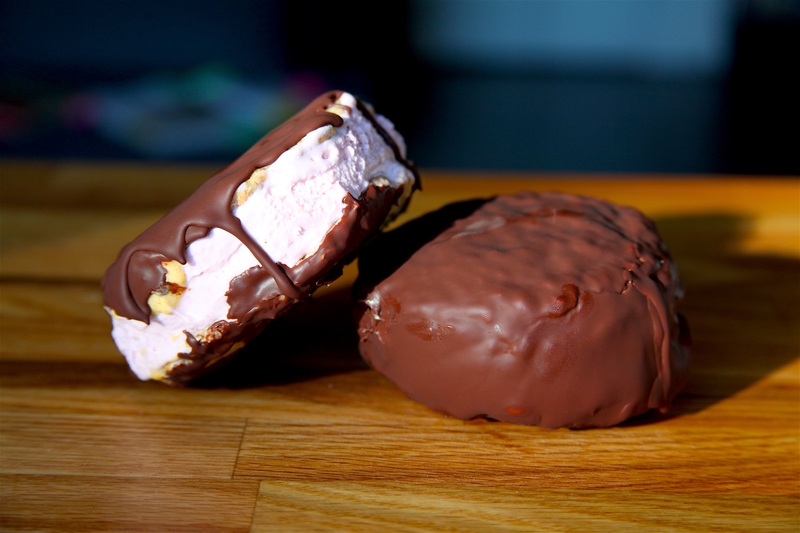 To recreate the It’s It ice cream sandwich, I tried to make the perfectly thin but crunchy chocolate shell (a.k.a. a “magic shell” chocolate). Additionally, I spun my own ice cream in order to recreate their bright ice cream colors. If you’re wondering–the strawberry = 4 drops red food coloring + 2 drops of blue food coloring; the mint = 1 drop of green food coloring + 5 drops of blue food coloring. I even made the pumpkin flavor but TBH it was not cute enough to present. If you’re looking for a good coffee ice cream recipe, I will shamelessly plug my own. 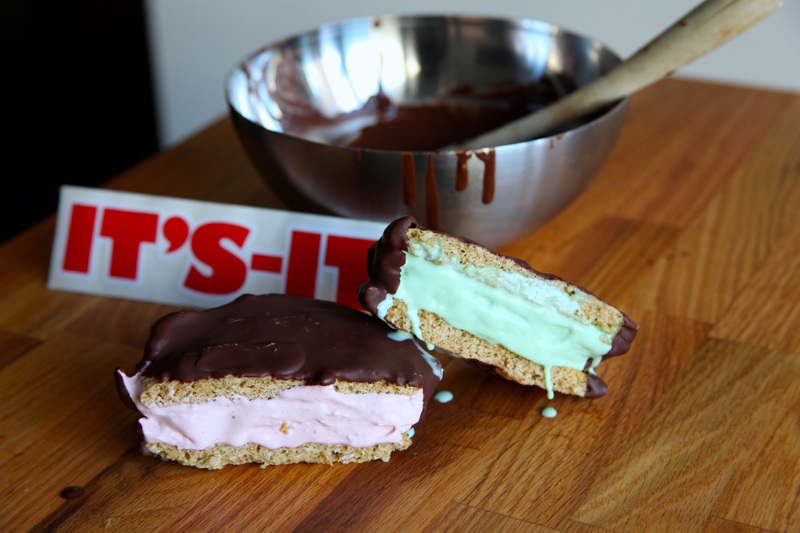 Learn how to make San Francisco’s best, the It’s-It ice cream sandwich. This recipe is for their famous oatmeal cookie dipped in chocolate. Make cookies. In a large mixing bowl, cream the butter, sugar and brown sugar until starts to pull away from sides. Beat in eggs individually until fully incorporated. Add vanilla. Mix in flour, baking soda, salt and cinnamon until fully incorporated. Mix in quick cooking oats until fully incorporated and chill in fridge for an hour. Preheat oven to 375 degrees F and grease cookie sheets. Roll dough into golfball sized balls and place 3 inches apart on cookie sheets. Flatten each cookie down with a fork to help them expand during bake. Bake for 10-12 minutes until golden. Allow to fully cool before assembling ice cream sandwiches. Make chocolate shell ice cream topping. 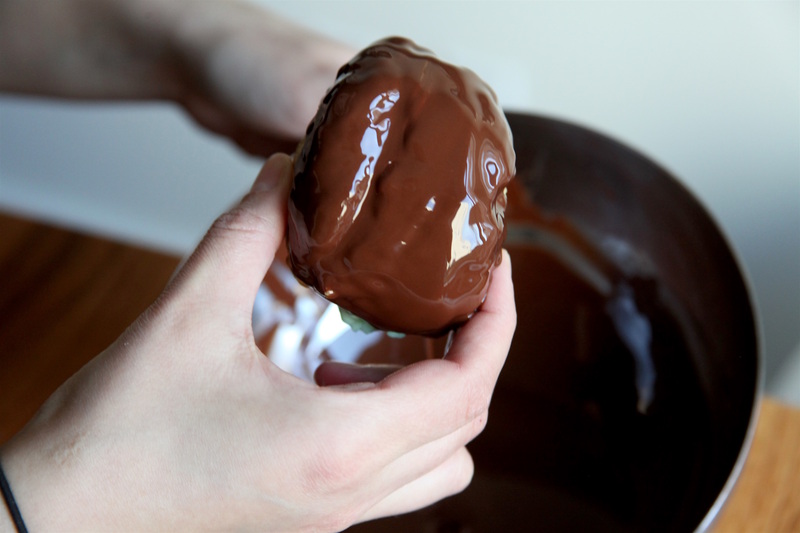 In a double boiler (a heat-proof bowl set on top of a pot of boiling water), stir and melt chopped chocolate until fully liquified. Assembly sandwiches. Scoop ice cream flavor of choice onto cooled cookie. Top with another cookie. Smooth out sides with a spoon that has been dipped in lukewarm water and place in freezer for 5-10 minutes. Remove frozen sandwiches from freezer and carefully dip each chocolate shell ice cream topping. Place fully dipped cookies on a cooling rack and place in freezer to harden again for 5-10 minutes. 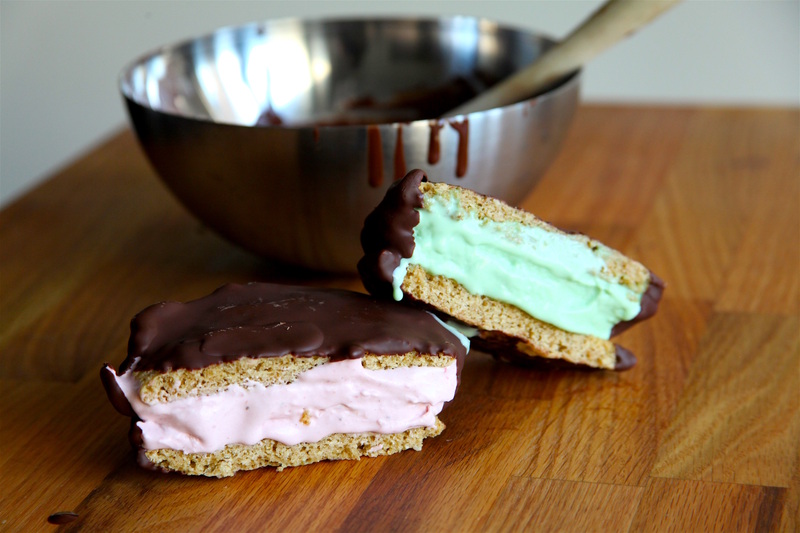 Made It’s-It ice cream sandwiches at home? Tag your chocolate dipped ice cream sandwich photos with #PateSmith or share them in the comments for the chance to be featured onsite!